This section contains a collection of short rhyming graduation poems that you may freely share with a student in your life (include inside a greeting card). You will find graduation poems for those graduating from preschool, kindergarten, elementary school, middle school, high school, and college/university. They may be shared with daughters, sons, sisters, brothers, friends, and virtually anyone else you'd like to congratulate. The first poem is simply a general school graduation verse that may apply to anyone who is graduating at any level. It's definitely a unique way to express your congratulations. I made sure it's also inspirational for those who receive it. I think it's very important to celebrate academic achievements. Whether it's a child's first certificate, or an adults college diploma, everyone's efforts and dedication need to be recognised. the goals in your sight. be a part of your quest. As you saw in the above graduation poem it was meant to both congratulate and inspire. It congratulated the child/teen/adult for the current achievements and success in school, and also attempted to inspire the person to continue their studies. The last stanza is trying to hint that education or the process of learning does not end at graduation. But rather begins at that point. I believe, that we need to teach our children to never stop learning in life. We need to show them the importance of embracing knowledge and learning as a lifestyle, not just a stage during our youth. Not only will this type of attitude open doors in their adult work life, but will also help enrich their everyday lives as well. Preschool was traditionally known as nursery school. So this poem is for all those wonderful little children who are graduating from preschool. This is often between the ages of three and five (depending on country and state). The poem serves two purposes. First it allows you to congratulate your child for completing preschool. Secondly, it eliminates some fears about starting kindergarten, through encouragement and positivity. I think it's very important to encourage and prepare a child mentally for a new transition in life (such as beginning kindergarten). It can be a very stressful time for a young child. That's why talking to your child and reassuring that everything will be alright and that school will be fun is important. Otherwise, a child may have difficulty adapting initially to the new mysterious environment. Kindergarten graduation usually occurs between the ages of 5-6. Kindergarten is an important transition for children, as it prepares them for grade one. and I love you my dear. I think it's very important to celebrate children's little milestones such as graduating from kindergarten. For us adults it may seem like no big deal. But for all those little kids it's a very big deal. They've worked very hard to absorb all that new information, and learned how to interact with other kids. These little but very important accomplishments need to be celebrated, so that children are aware that they are doing a good job and so that they feel appreciated. They require appreciation and praise just like anyone else. I hope this one puts a lot of smiles on a lot of kids/teens out there. Elementary or grade or primary school often ends between grade 5 and 8 depending on the country and school board. This means kids that graduate from elementary school are usually between 11 and 14 years of age. I hope this poem is relevant to them. When I was a child I changed elementary schools approximately five times. It definitely wasn't easy staring over each time. Trying to blend in and make friends every year or so. It seemed like, just when I was beginning to adapt and get accustomed to my new school, we'd end up moving. It was tough, but I think it also instilled a sense of bravery and adventurous spirit within me. For that, I am grateful. Here's a verse for all the teens out there that have completed middle school and are about to enter high school. Graduating from middle school is obviously a very exciting event. This is the transition where children grow up and change both physically and emotionally. When I was 13, I lived in Halifax and attended a Junior High there (middle school). From what I can remember, I really enjoyed it there, even though life seemed a lot slower on the east coast than it did in a major metropolitan. This next one is for all those students that have successfully graduated from high school. A lot of people may think graduating from high school is not a big deal these days, as if it's expected. But the reality is, not everyone graduates. It takes work and dedication, and it's hard enough with all the distractions and negative influences that are associated with those high school years. and your path will right. I think it's very important to encourage high school graduates to pursue their true passions. I know parents may often try to guide their children to study certain fields in college and university that they themselves favour. This is normal, since parents want the best for their kids. However, a person that pursues his or her own deep passions will become successful no matter what profession they choose. They will be successful because if they end up working in a field they enjoy, it won't seem like work (but rather like a hobby). As a result, they will be driven and will look forward to getting up each morning and doing what they love and truly enjoy. I hope all those college or university grads out there will enjoy the following verse (they've certainly earned it). 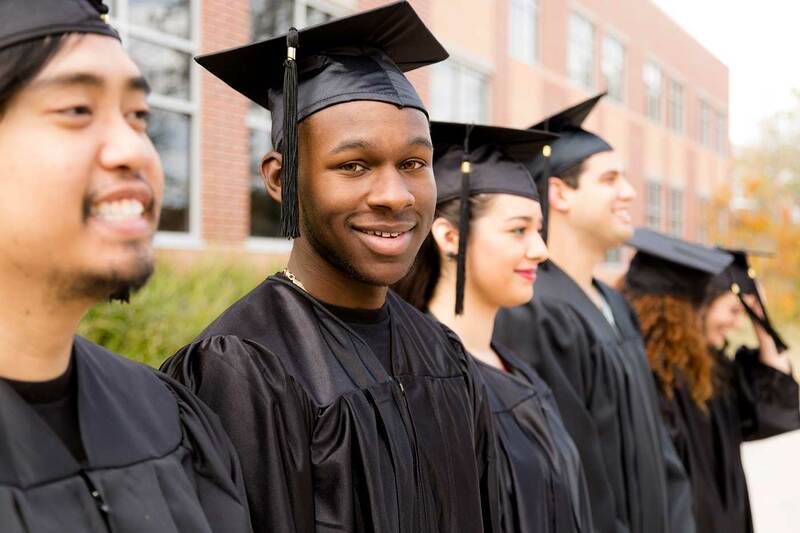 It takes a lot of work in order to successfully graduate from a post-secondary institution. But the journey is definitely worth it and in my view life changing. I strongly believe that colleges and universities are places where young students have the opportunity to both mature into responsible adults and also figure out their true passions and find some direction in life. Share this one with your daughter on her graduation day. I hope it's relevant for daughters of various ages, and that are at different stages in life. The goal here was to make each verse cute, short, and girly. in your favorite new dress. if I get a bit loud. I can no longer suppress. Young boys or men, may not always show an interest in poetry, but I'm sure they'll appreciate the following poem that is tailored to their success. Everyone likes being appreciated and acknowledged for their efforts and accomplishments (even boys/men). from here I can see. The following funny graduation poem was written to make the graduate smile and laugh. Feel free to share it with a graduate that has a healthy sense of humour. you may need to hurry. we'd call you a Star! Here’s a funny graduation poem that is meant to be shared with all those new graduates (at any level). you’ve made it, you’re done. and soak in some fun. to get where you are. it’s all windy with gloom. if you begin with a broom. you still have your youth. or you may lose a tooth. if you mention the price. I’m thinking of sharing this poem with my sister on the day of her college graduation. But feel free to share it with anyone you know. The last verse is definitely my favorite from this poem. It reminds us the cost of higher education these days, which is absolutely ridiculous. It seems they’ve made a thriving industry around educating our youth. So instead of investing in our youth and making education more accessible and universal, it seems like we’re moving backwards. Countless students spend many years and borrow hundreds of thousands to receive a good education. Many of them will end up paying these loans back over the course of their adult lives. I don’t think that’s very fair. On a lighter note, I hope you enjoyed reading today’s funny graduation poem, and I hope it makes the next graduate you share it with laugh out loud. I hope this section helped you find a relevant and useful graduation poem for that recent graduate in your life. Whether the graduate is five or twenty-five, I'm sure your thoughtful gesture will be appreciated and will enrich the graduation day a little bit more. Maybe if you share one of these graduation poems with the graduate right before the ceremony, it may help with fighting those butterflies and anxiety. Hope you and your loved ones have lots of fun, and enjoy the whole day (while focusing on the new graduate).